Following the success of the Pyeongchang Winter Olympics, Korea will continue to show its strength as a destination for international conferences. The Korea Tourism Organisation (KTO) is holding a special tour to introduce Korea as a conference destination. The tour has already shared the country’s MICE opportunities to audiences in Austria, Belgium, and the United States, and London is next. Continue Reading	. . . Reaching the Gateway to Central, Eastern Europe LOT Polish Airlines Launches Direct Flights between Warsaw and Incheon, Korea Source: Koreatimes.co.kr | October 28, 2016	. . .
Newly-expanded Seoul MICE Alliance Boosts City’s Business Events Competitiveness Seoul’s public and private sectors have strengthened ties over the past month through a series of initiatives designed to make the city more accessible to international business events hosted in the city and their participants. This includes a dramatic boost in membership in October for the Seoul MICE Alliance (SMA) ahead Continue Reading	. . .
[Korea] Exclusive Shuttle Bus for Foreigners to Mt. Naejangsan National Park! Exclusive Shuttle Bus for Foreigners to Naejangsan National Park! Photo: Beautiful fall foliage scenery seen at Naejangsan National Park From November 4 to November 13, a shuttle bus exclusively for foreigners will be departing from Seoul to the all-time popular fall foliage destination, Naejangsan National Park in Jeongeup, Jeollabuk-do. The shuttle bus will be departing from Gwanghwamun, in Continue Reading	. . .
Korea will host the 2017 Great Ideas Global Association Management Conference Asia-Pacific, bringing to the country association executives from across the globe for networking and knowledge-sharing. Scheduled to take place at the Grand Hyatt Seoul from March 22-24, the conference will also be an opportunity to highlight Korea’s role as a regular host of large-scale international association meetings. The securing Continue Reading	. 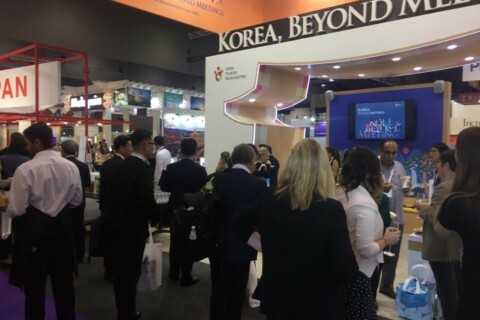 . .
Korea Sale FESTA Welcomes Visitors and Showcases Expanding MICE Capabilities The shopping and tourism campaign Korea Sales FESTA seeks to boost tourist arrivals and showcase the country’s rapidly growing tourism infrastructure and services. Jointly hosted by the Ministry of Trade, Industry and Energy and the Ministry of Culture, Sports and Tourism, the campaign is running from September 29 to October Continue Reading	. . . Global Shopping Festival ‘Korea Sale FESTA’ running Sep-Oct Photo: Korea Sale FESTA poster Korea Sale FESTA is a grand shopping and tourism festival taking place September 29 through October 31. An expansion on last year’s Korea Place Friday, Korea Sale FESTA includes Korea Grand Sale, a popular shopping festival offering discounts galore, along with cultural events and hallyu entertainment throughout Continue Reading	. . .
Korea MICE Bureau Website Relaunch Offers Free Roundtrip Flight to Seoul [August 31, Seoul] The Korea MICE Bureau (KMB) is offering free flights to Korea plus accommodation along with other prizes as part of an event to promote its newly-upgraded website. Open to all, the online promotion is designed to raise awareness of the KMB, the business events division Continue Reading	. . . Largest-ever incentive tour group from Japan due in S. Korea Over 10,000 employees of a major Japanese funeral service company will visit South Korea between this fall and next spring, the state-run Korea Tourism Organization said Wednesday. The unprecedented group of Japanese visitors will arrive in Seoul and Busan in a period spanning six months starting from October, KTO Continue Reading	. . .
[Korea] Incheon Int’l Airport Transit Passengers’ Benefit! Incheon Int’l Airport Transit Passengers’ Benefit! Incheon International Airport has opened an In-Transit Medical Tourism Center in the passenger terminal for all travelers. Photo: Incheon In-Transit Medical Tourism Center Travelers departing from Korea or transferring flights at the airport can visit the center to make use of the many services, including simple health checks, fatigue treatment and skin care Continue Reading	. . .